It’s the eighth landing spot of this mysterious helicopter. 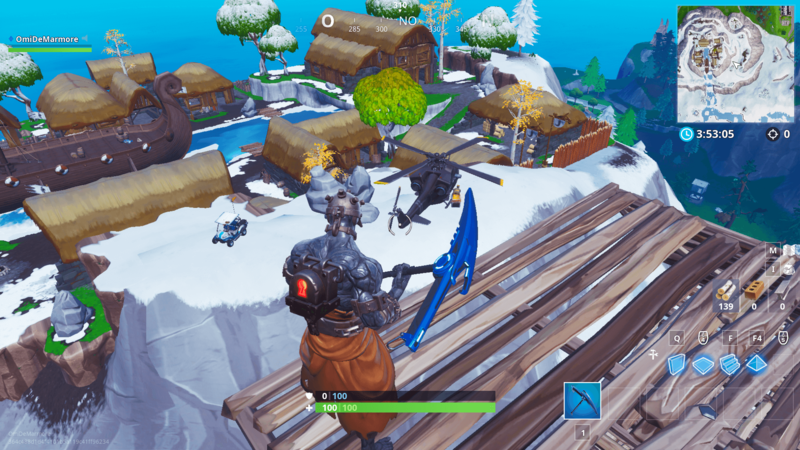 Fortnite’s season eight mysterious helicopter has now landed at Viking Village, west of the island. The helicopter was spotted there this morning, having moved from south of Polar Peak. It didn’t change anything in the area, just like it hasn’t altered the other seven areas where it’s already landed. Players still have no clue about what this black military helicopter means. They just know it’s been moving along the edge of the Fortnite island since it was first spotted northeast of Lazy Lagoon. Everyone’s best guess is that something will happen once it flies around the entire island, returning to Lazy Lagoon. Some old theories still seem valid. Players said it moves when a helicopter item is in the Item Shop, and it was true for when players saw it on Happy Hamlet. This time, the Paper Plane glider was launched in the Item Shop last night, which isn’t a helicopter, but is at least something that can fly. Apparently, any object that can fly and is added to the Item Shop will be a hint that the helicopter is about to move. Related: All landing spots of the helicopter in Fortnite: Battle Royale’s season 8. Other new theories have some players thinking that the helicopter is “just doing a perimeter sweep before they launch the nukes,” even though we have no hints at nukes in the map. Others say the helicopter is “looking at all the old crater locations in season four to see if they forgot any hop rocks,” which could make sense considering how close the locations are, but it’d probably mean that nothing will happen once the helicopter is done with its sweep. The helicopter will remain a mystery for a while. The best players can do for now is keep an eye on the Item Shop to check for items that can fly and check north of the map the next time this happens. Players will surely keep on creating theories for this uneventful mystery.